York College is a great place to develop your talents and pursue your passion for music, whether you simply enjoy it as a hobby or want to make it your profession. Interested in majoring in music performance or education? Check out the music department homepage. 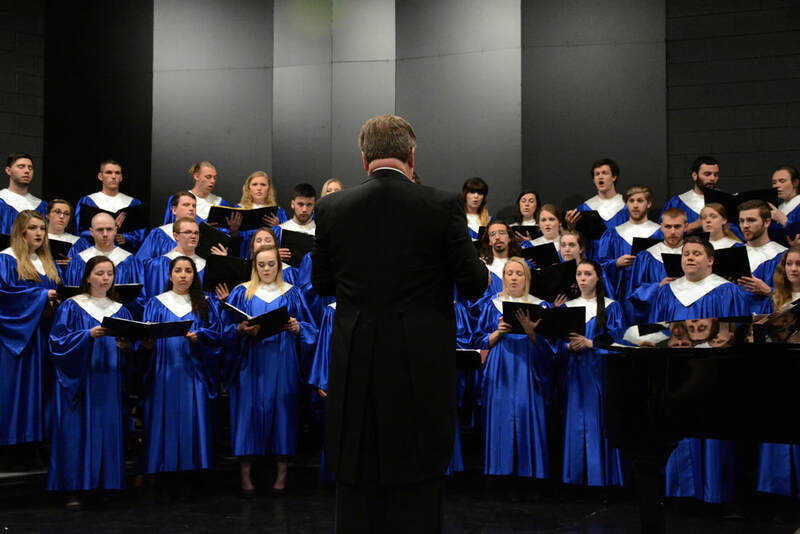 York College offers two vocal ensemble opportunities, Concert Choir and Celebration Singers. There are also other performance opportunities such as Songfest and vocal studio recitals. Piano instruction is also offered through the music department from beginners to advanced players. The Concert Choir is the premier performing ensemble at York College. Members are required to meet a rigid rehearsal schedule and to maintain a minimum GPA. Each year they travel 3,000 – 4,000 miles representing York College. They have performed all across the United States, as well as Canada and Japan. The choir is comprised of all grade levels and majors, and is highly recognized for their level of choral artistry. The concert choir is under the direction of Dr. Clark Roush, Professor of Music and Endowed Chair for the Performing Arts. Dr. Roush is in his 33rd year as conductor of this group. Dr. Roush is active as a guest clinician, conductor, and adjudicator, and is a published author. He earned his Bachelor’s Degree at Harding University, his masters from the University of Iowa, and his Doctoral degree from the University of Nebraska. Dr. Roush also is a motivational speaker and presenter on leadership, time management, group dynamics, problem solving, and worship renewal. East Hill Church of Christ @ 10 a.m. Interested in auditioning for the choir? Please complete this form to get started. Celebration Singers is a small ensemble that performs popular and seasonal music. It functions much like a swing choir, and gives members an opportunity to sing a style of music beyond the traditional choral repertoire. Of special benefit for music and music education majors, participation also provides training in choreography, costuming, and staging. Membership is by audition and is open to all majors and all grade levels.